The chefs of Terzo Piano design an Italian dinner party. The chefs at Terzo Piano are well attuned to the pull of being outdoors during a Chicago summer. And they know they can’t always provide an outdoor meal for you—the restaurant, which claims a rooftop patio on top of the Art Institute’s Modern Wing, is open for dinner only on Thursdays. So for every other day of the week, Meg Colleran Sahs and her Terzo co-chefs came up with recipes for an Italian dinner on your own patio. 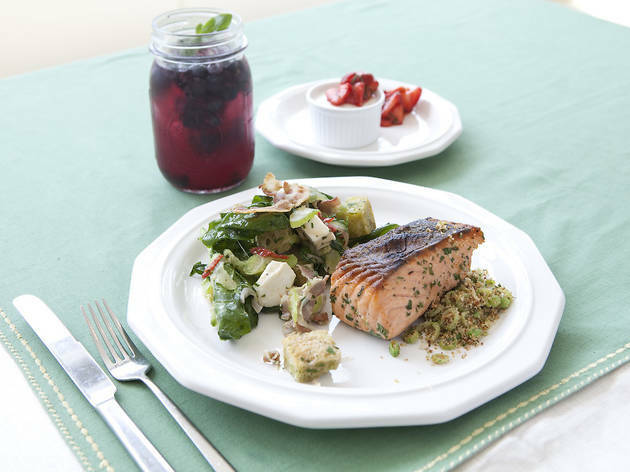 It starts with a blueberry cocktail that’s an Italian twist on the Mexican/Spanish aqua dulce (“sweet water”), continues with grilled salmon atop spinach panzanella and finishes with a ricotta-berry mousse. 1. Make a simple syrup: Combine the sugar and 1 cup water in a saucepan over medium heat. Stir until the sugar is dissolved and place in the refrigerator until chilled. 2. 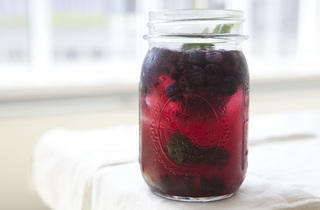 Muddle the drink: Place blueberries, basil and simple syrup together in a large pitcher. Using a wooden spoon, smash the blueberries and basil together until well combined. Add lemonade and remaining 1 cup water, and stir well. 3. Pour: Fill rocks glasses to the brim with ice. 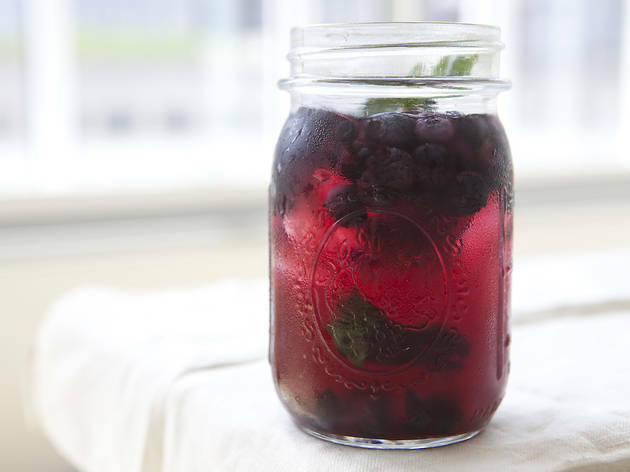 If using the rum, add 1–2 ounces to each glass and top with the blueberry-basil mixture, making sure to include some of the blueberry and basil pieces. Stir well to chill. 1. Marinate the fish: Combine oil, herbs and lemon zest in a small bowl. 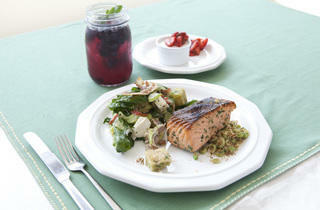 Lay salmon pieces in a glass baking dish. Coat the salmon with the oil mixture to marinate. Let marinate for at least one hour, turning the fish over in the dish halfway through. If marinating for longer than one hour, keep dish in the refrigerator. 2. Get the grill going. 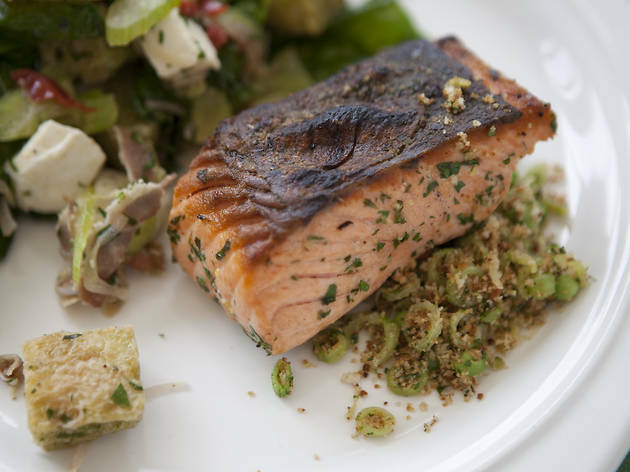 High heat is best to ensure the skin on the salmon gets crispy on the grill and does not stick. Wipe the grill clean with an oiled paper towel, careful to not let the paper burn. 4. Serve. 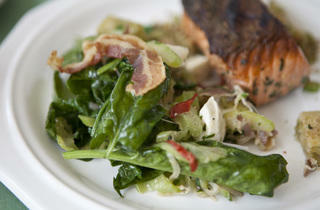 Lay salmon onto a platter with the skin up to keep it nice and crispy before eating. 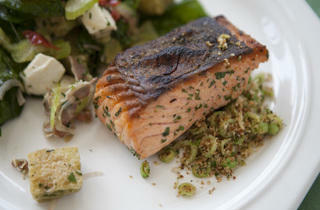 Spoon some snap pea gremolata over the top of the fish and around the platter. Add lemon wedges if desired and serve immediately. 1. Cook the snap peas: Bring a large pot of water to boil. Add a generous amount of kosher salt to the water (it should taste like seawater), then add the snap peas. Cook until al dente. Remove quickly to an ice bath to stop the cooking process. Once cool, remove the peas from the ice bath and cut into small pieces. 2. Make gremolata: Mix snap peas with all other ingredients in a medium bowl. Season with kosher salt and freshly ground black pepper to taste. Reserve. 2. Make herb croutons: Pre-heat oven to 325 degrees. On a flat baking dish/sheet tray, toss bread pieces with herb oil to coat, then sprinkle with sea salt and black pepper. Bake in the preheated oven until crisp, eight to ten minutes. Set aside until ready to use. 3. Cook pancetta/vegetables: Place a medium sauté pan over medium-high heat and cook pancetta until crisp, about three minutes per side. Remove from the pan (keeping the pancetta fat in the pan) and drain on paper towels. In the same sauté pan, add the shallot, chili and celery, season with salt and cook for three to four minutes until slightly soft. Remove from heat and mix with chopped herbs and celery leaves. When cooled, cut the pancetta into bite-sized pieces. 4. Wilt spinach: Turn the grill to medium low heat. Toss the spinach with extra virgin olive oil and season with kosher salt. Transfer the spinach to the grill to wilt slightly, just one minute per side. Remove from grill. Once cool enough to handle, remove the stems from the spinach. 5. 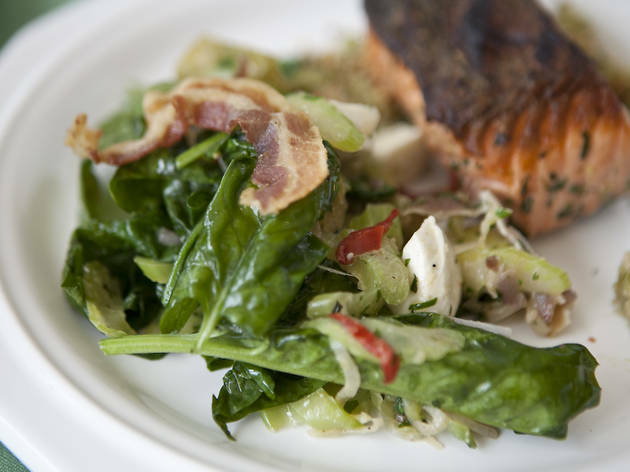 Serve: In a large mixing bowl, combine the grilled spinach, croutons, pancetta, vegetable-herb mixture and mozzarella. Add red wine vinegar, lemon juice and extra virgin olive oil and toss gently to coat. Taste and season with salt and pepper. Let the salad sit for ten minutes to allow the dressing to soak into the croutons, then serve. 1. Place gelatin sheets into a bowl of ice water to bloom. Place ricotta into a large mixing bowl. 2. Heat the milk and sugar in a small saucepot over medium heat. While stirring to avoid scalding, cook until the milk is lightly steaming and sugar is dissolved. Remove from heat. 3. Drain the bloomed gelatin sheets and add to the warm milk mixture until gelatin is melted. Pour warm milk mixture over ricotta and whisk until smooth. Divide mousse among five small ramekins. 4. 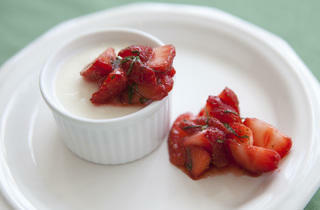 Move the ramekins to a sheet tray and into the refrigerator to set, at least two hours. Spoon the basil-berry accompaniment (see recipe) over mousse and serve. 1. Combine strawberries with sugar in a small bowl, stir well. Let the mixture sit for a few minutes to soften up the strawberries and dissolve the sugar. Stir again and then add basil and lemon juice just before serving with the ricotta mousse.